This is a critical distinction at a time when the Fed is contemplating not only ending its rate hike cycle - and thus curve flattening impulse - but potentially cutting rates, at least if it agrees with the market, so soon as late 2019, which in turn would prompt a sharp spike in the yield curve and, as we argued in our post explaining why the Fed is trapped, catalyze the next recession. To be sure, nothing is set in stone, and as Goldman strategist Ian Wright writes, much focus remains on the state of US growth, the ongoing US-China trader war, the US government shutdown, and Brexit, each of which could tip the Fed's hand. And yet, amid this uncertain backdrop, recent weeks have been good for risky assets. Oil has risen sharply, with GSCI Energy now up 16% on the year. Credit has also rallied - especially on a risk-adjusted basis - and undone almost all of its December spread widening, in both IG and HY, and USD and EUR markets. Last but not least, the S&P 500 is up 14% since the Steve Mnuchin called the Plunge Protection team on December 24 (and since the government shutdown). Sarcasm aside, the recent risk was largely the result of Powell's abrupt dovish reversal and has been supported by the abatement of concerns about central banks hiking rates. In the past month, markets have priced both the Fed and ECB more dovishly in the coming year, with no hikes priced for the Fed in 2019 and a first ECB hike priced only in 2020 (notably, 10-year yields have risen amid the recent risk-on, as the correlation between stocks and bonds which recently shocked market watchers when it inverted, appears to be normalizing somewhat). Meanwhile, as the Goldman strategist writes, even as the bank's economists’ view remains that the Fed will hike again in June, followed by December, the bank's clients have asked "if the Fed is done with its hiking cycle"... and, if so, what the implications for asset prices would be. And while we know that the first rate cut following a hiking cycle has been a clear signal for an imminent recession in the last three contractions, the question is what happens to risk assets once the Fed stops hiking. Here the answer is a little more nebulous. 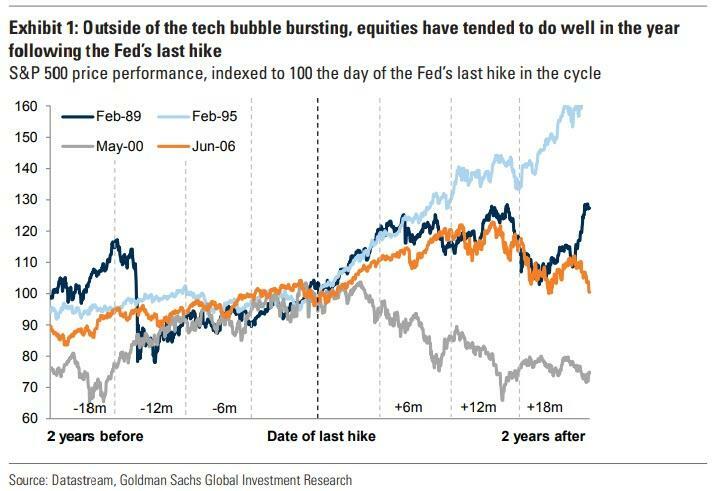 Looking at the end of the past four Fed hiking cycles (1989, 1995, 2000 and 2006), Goldman finds US equities have tended to do relatively well in the year following the Fed’s last hike (Exhibit 1). The exception to this was in 2000, when the tech bubble burst, while equities did exceptionally well in 1995, which however was the only time the last hike was not followed by a recession in the coming years. It is also worth noting that while there was no immediate bear market in the year following the last rate hike in June 2006, everyone knows what happened shortly thereafter. The average result, Goldman notes, may be surprising because growth expectations (measured by the ISM manufacturing) also tend to fall into and after the Fed’s last hike in a cycle (Exhibit 2). What about rates? 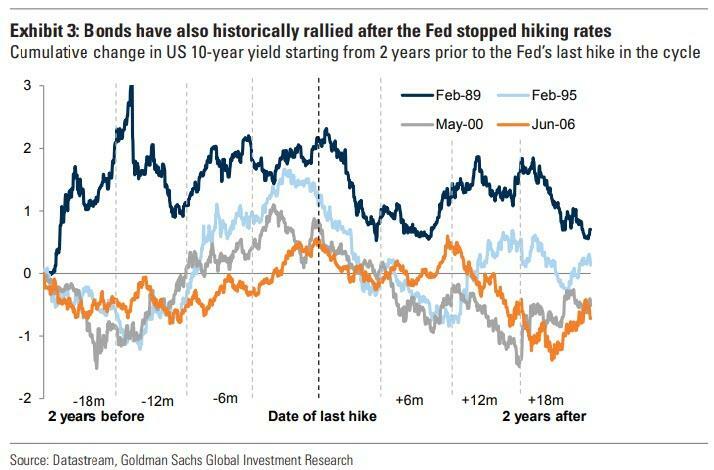 Here Goldman finds that 10-year Treasuries tend to rally strongly following the last Fed hike (Exhibit 3) hence the sharp steepening in the yield curve noted above just before a recession. The fact that the Fed has not cut rates soon after ending hikes, but rather held rates high, could explain these findings. 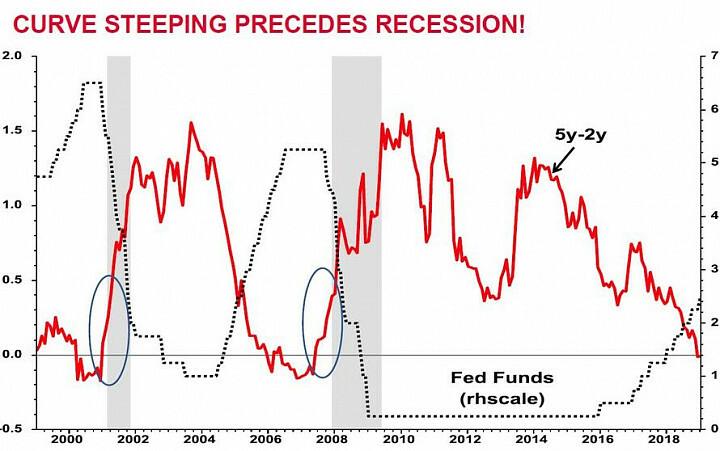 In other words, equities may benefit from the reprieve in rates rising further, without recession concerns rising immediately (which would drive cuts). 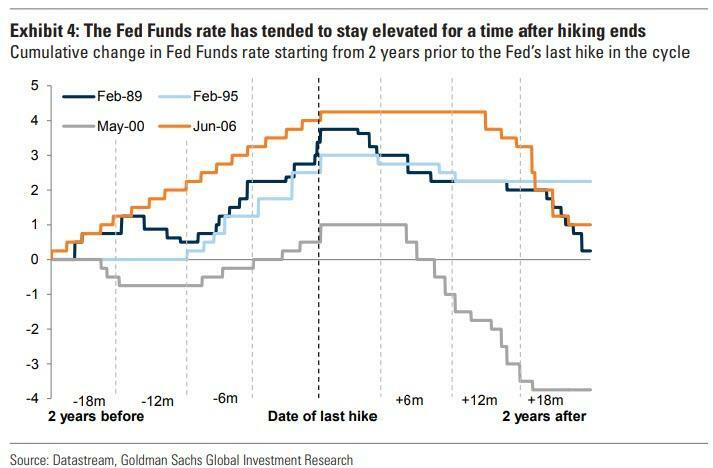 However, the bond market prices the end of hikes and future rate cuts over a long window, creating an interplay whereby the Fed's actions force a sharp curve steepening, which in turn is interpreted by the market as a recession onset and in turn results in a bear market for equities. 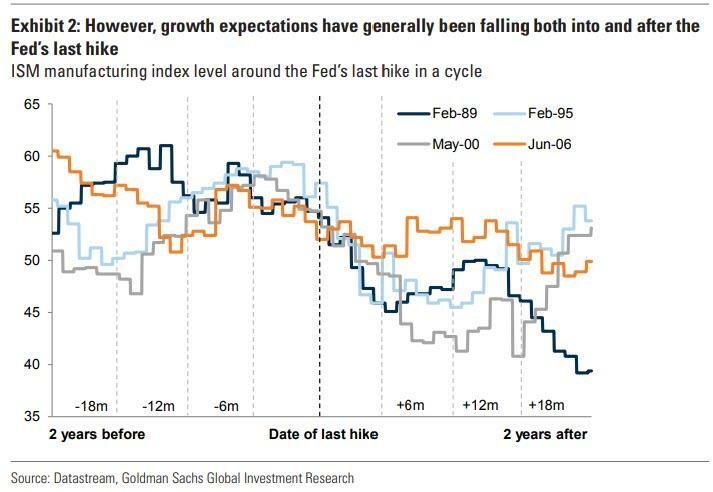 Finally, Goldman notes that these results could be different from what happens should the Fed pause in its hiking cycle, something Powell may be actively considering as he decides whether to keep hiking or capitulate, and cut rates, catalyzing the next recession.